Chad and I hit the road for North Dakota early next week to get some last minute scouting and hanging done prior to Rachel and Lenny's arrival early Friday when we kick off the 2013 season in what's become a tradition: chasing velvet bucks in North Dakota! We’ve once again reached that time of year when a whitetail hunter thinks to him or herself, (another year is in the books and its 9 long months of waiting to get back out there after the big one). Its now mid January and most if not all of the Midwest seasons are closed now, there’s snow on the ground, football on TV and the temps alone are enough to keep us indoors where its warm. For the most part the statement above is true, but like some other hunters I look at this time of the year as just the beginning and one of the most crucial times of the year for a whitetail hunter. Some of you may be asking what on earth could one do right now to better them selves for next fall? The answers are endless to tell you the truth; here are just a few important things a whitetail hunter can do to start preparing for next fall. The first thing I do after the season is over is, assess what has happened over the last 3-4 months. Where did I see high numbers of deer, where didn’t I see many deer, was there enough food on the property for the deer, was there enough cover, most importantly did I reach my goals I set for last fall. These are all great observations you can make without even leaving the living room couch. And after you answer questions like this, your answers and thoughts go to work. For me reaching my goals is the very most important question I answer every year at this time. This allows me to evaluate my properties I hunt and go through all my ideas that have worked, the ones that didn’t, and most importantly what can I do next to better reach my goals as a whitetail hunter. At the top of my goals for each property I hunt is to hold and grow deer on that property. Food, water and cover are the key ingredients that will get me to this goal. Fortunately some of the properties we hunt already have everything you need, but others don’t. When you look at what you need more of on a property it is very simple to get a head start right now. For instances I know there one farm that drastically needs more food. With food plots already established, I’ve been slowly making them bigger and bigger every year. I’m simply doing with a chainsaw and an ATV. Here and there when I get free time, starting a couple weeks ago, I head out with a saw and get a couple hours of cutting done in hopes that by the time the ground thaws I will have met my goal of what I wanted to cut. Another great thing one can do this time of year is improving the cover in known bedding areas. Once again with a chainsaw one can really make a difference in the habitat by making “hinge cuts” in designated areas. If you don’t know what “hinge cutting” is I would recommend looking into to it, it’s the simplest way to get results when trying to improve the bedding on a property. I’ve personally done a lot of hinge cuts over the past couple years and it really seems to be the ticket. These are just a couple of the many tasks one could be doing if he or she wants to fight the cabin fever this winter and more importantly, it gives you a huge head start on preparing yourself for the hunt next fall. Not only are you improving the habitat on your property, you never know what or when you can learn something you’ve been missing while your in the woods. It always amazes me how many times this time of year I learn something that I wish I would have known two 2 months ago. But the fact of knowing it now will allow me to use that piece of information next fall. Here is handful of highlight pictures from this past season. Take a look at them and be sure to check out the shows if you missed any. We will be airing last falls shows every Sunday from now thru the first week in April when we start our Semi-Live Turkey Hunts. Also we will be having our first Video Produced this Spring, “Whitetail Edition I” with hopes of it hitting the shelves in April/May. Be sure to follow us on Facebook and Twitter and we thank you for your support. Here we are once again with the December Holidays fast approaching. Along with that, comes a closing nearby to most of our Whitetail Seasons across the Midwest. Rachel and I arrived home Sunday evening to a 4 inch blanket of snow covering the ground. This is just what we needed to get the mature bucks up on their feet during the daylight. We have a few different properties with late season food on it, and we plan to zero in on a good buck. This is where the Reconyx cameras really come into play. We will be setting multiple cameras on each plot in hopes of getting the MRI to help us increase our chances of punching our bow tags in the late season. Stay tuned to the Live Journal and the Website as the action heats up in Wisconsin. Earlier today we closed the 2012 Wisconsin Muzzleloader season with my tag un-punched. We hunted hard everyday to try and get a mature buck within range. With the warm temps slowing the deer movement down we struggle to even get on a mature deer. The Muzzleloader season wasn't a loss though...for those of you who seen last weeks show you know we took out a first time hunter, Adam. Even though he only harvested a doe, he still had a great time and talks of not being able to wait till he can get out next year. So all in all it was a successful hunt none the less! But I still have four more days with my Savage Model 10ML-II 50 cal. Tomorrow afternoon I will be set up in Kansas to try and fill my tag, once again with the clock ticking closer and closer to the end of that season. 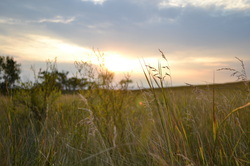 Kansas's Gun season closes at the end of legal shooting light this Sunday December 9th. With 3 1/2 days to get it done make sure you stay tuned to our Live Journal to see if I can get it done! Also if you haven't done so already please follow us on Facebook and Twitter. Thanks for your support. Most people forget, but Wisconsin's gun season is actually 19 days long. 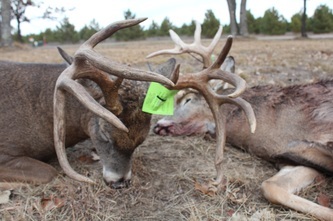 You get 9 days to fill your tag with a rifle and 10 days with a muzzleloader. This year, I need that second chance. 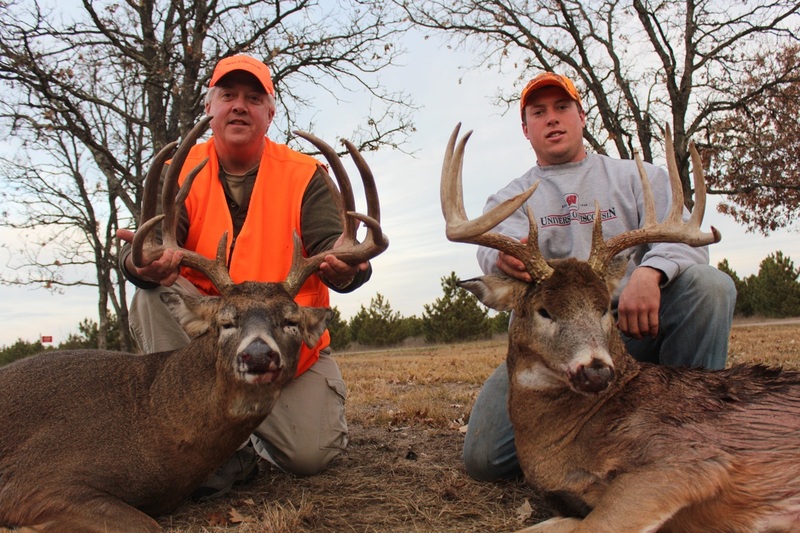 Unfortunately, the Wisconsin woods are completely chaotic and unpredictable; the tradition of rifle season brings heavy hunting pressure and education to mature whitetails. On the other hand, mature bucks we have never seen before can be pushed onto our property without even knowing it. I am hoping that the low temps drive the mature bucks, out in daylight, to a food source where I will be waiting for my second chance. Who knows, maybe a giant will show up that we've never seen before!? Chad and his father knock down two Wisconsin studs! A 7 1/2 year old Gross 169 7/8 and a 5 1/2 year old 157 7/8. Story and pictures coming soon to Harvest Blog. After a poor week of hunting in Wisconsin, Lenny and Chad head to Kansas to try and see if their luck will change. They arrived in perfect timing with a big cold front moving through the area, this would definitely get the deer up on their feet. With the first day in the books it looks as they are right on time as far as the rut schedule goes. They seen many deer moving throughout the day with multiple encounters with different bucks. There were two shooters that skirted just outside of bow range as well. With the rut action heating up in Kanas it seems their luck has changed. Keep up with the Crew on our Live Blog and remember to follow us on Facebook and Twitter! 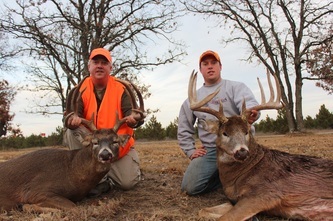 Stay turned for more big buck Kansas action! Well, as we count down the hours until November, we've seen the action picking up every day. Lenny was able to capitalize on a good buck yesterday morning so be sure to check out the Harvest Blog and watch his hunt on Sunday's webisode! I had a promising young eight come into the decoy on Monday night and had an encounter with a pretty good main frame ten we've got a couple years of history with. Our crew will be in the woods every single day over the next couple weeks so be sure to check back as a good one can be put down at any time now! Well, we weren't able to connect in North Dakota. We gave it one last effort this morning and once again, conditions were perfect and absolutely beautiful for a late October morning (just check out the pictures below). We saw quite a few deer working their way back to the bedding areas and saw two mature bucks that just wouldn't cooperate, once again. There's a chance we will be back out during the late archery season here so we may get another chance to punch the tag. We are just loading up the truck and about to hit the road back to Wisconsin. 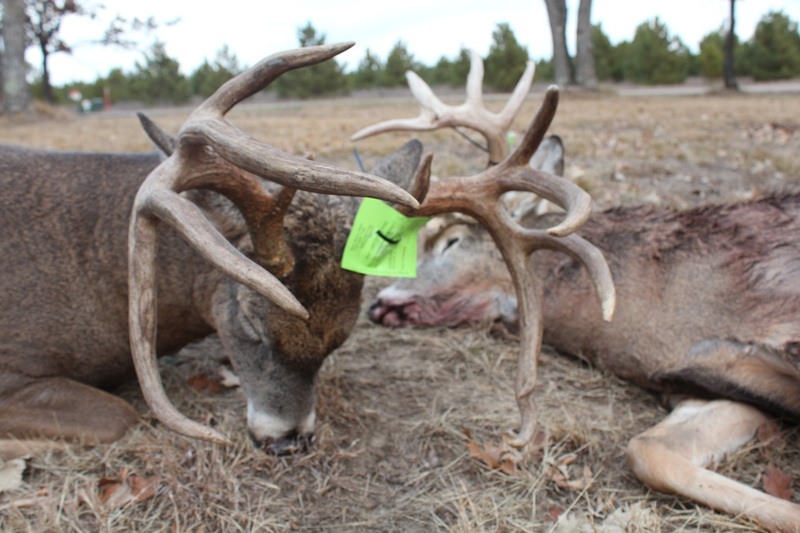 It looks like the 1, 2, and 3 year-old bucks in our home state are really starting to chase so it shouldn't be long before the mature 5 and 6 year-old bucks start in on the action. We'll be hitting the woods every day over the next two weeks so be sure to check back regularly as we update you on our action. With a warm-up in Wisconsin over the past week and a North Dakota non-res archery tag still burning a hole in my pocket, Chad and I decided to load up the truck and meet this latest cold front head-on, as it pushed through the northern plains. Although we arrived in plenty of time to hunt this morning, a brutally cold and gusting wind out of the northwest had Chad and I holed up in the truck at first light, glassing an area we've previously hunted. There was no question a cold front had just punched through the area. We saw what we estimated at roughly 150 whitetails in just a couple of hours. We spent the rest of the morning hanging our Reconyx cameras in a couple of other possible stand locations and getting everything ready for the afternoon hunt. Be sure and check back tomorrow evening for an update on the day's hunt!